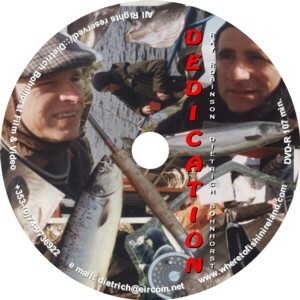 In 1995 Dietrich Bohnhorst and Ray Robinson produced DEDICATION, a four part movie, following two dedicated fly-fishers through various entertaining and exciting expeditions on land and sea in the North-West of Ireland. After DEDICATION was shown on European TV via French Station AB-Sat and in North America via a cable network it became somewhat of an angler's cult film. Dedication is not a how to or where to go program. It's a slice of life! DEDICATION is not a how to or where to go program. It's a slice of life. DEDICATION is a rambling fishy tail of two awld fellers as grizzled as the hills they roam, searching for the ultimate fish. Indispersed with the actual fishing are numerous fly-tying tips, essential to every madman, crazy enough to follow their examples. What is not in doubt in DEDICATION (apart from the stunning photography) is the sheer joy of fishing in all weathers by two men who know what they are talking about, - and can (almost) convince even the most sceptical about the "one that got away".